A few months ago I met a motorcycle I haven't been able to get out of my head. 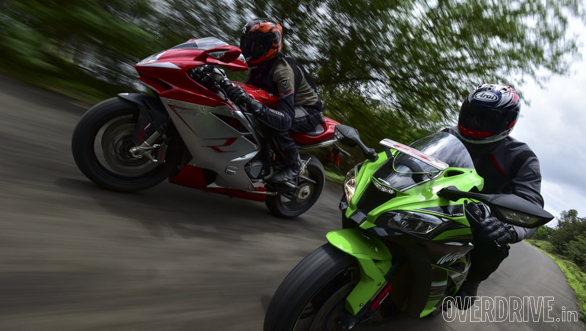 To date, nothing has come close to offering the Kawasaki Ninja ZX-10R's combination of reasonable price, superlative performance and general slow-speed ease of riding. The Japanese Ninja is so damn good that we were really curious to see what it was like against a similarly specced, exotic European machine. 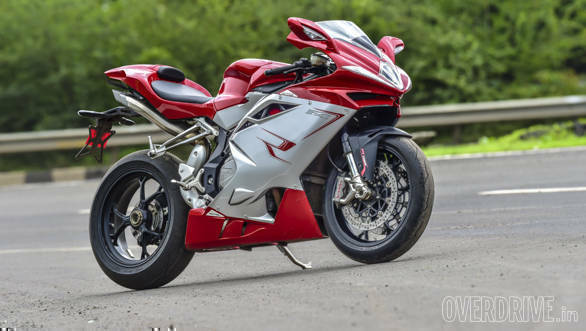 Unfortunately, it's really hard to get bikes of such pedigree to test, so when MV Agusta called to say the F4 R was available, we jumped at the opportunity. After all, motorcycles don't get much more exotic or evocative than an MV Agusta, do they! 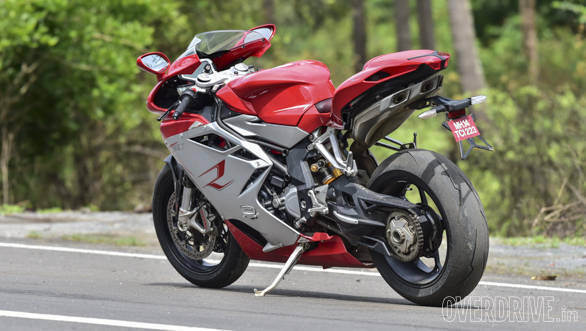 When you first see an MV Agusta F4, you can't help but stop and soak it all in. This is, along with the Ducati 916 (coincidentally designed by the same Massimo Tamburini), one of the most iconic sportsbike designs of the last 20 years. It's hard to believe that this basic design has been around for two decades, so gracefully has it aged. 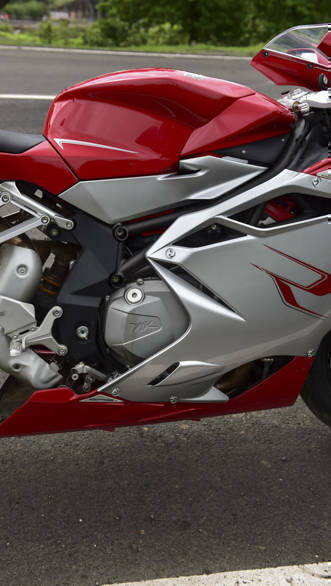 The flat face looks like it will be the perfect aerodynamic tool to keep the front pressed down at high speeds, and the red/silver colour scheme is unmistakable on the hard edged fairing. The only sign of age is the fat tail, in an era where slimmer rear ends are all the rage. There are also some lovely touches on a closer look. The mirrors have little air ducts for better aerodynamics, while the subtle wings below the front intake sport thin LED DRLs. The fact that this bike is so track focussed shows in the quick release fairing fasteners, short footpegs, and that beautiful single side swingarm that doesn't just look cool but also reduces weight and facilitates faster tyre changes. It all feels very special. There is no question this bike is an icon and that Tamburini was a genius, but motorcycles and their designs do need to move on with time. There's a sense that MV may not consider it worthwhile to risk significantly altering a design so fundamentally associated with the brand. 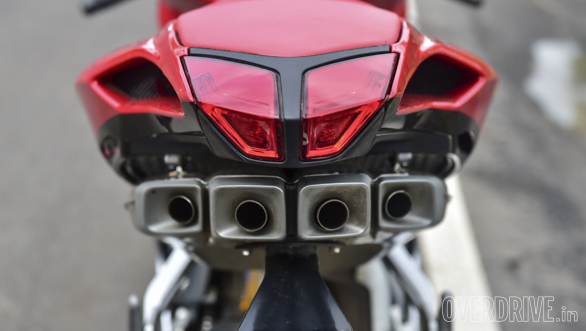 Ducati suffered the same quandary with the 916, dragging the design all the way to the 998. Ten long years later came the boldly different 999, a vastly better motorcycle but one that received considerable flak for its looks. But the 999 gave way to the lovely 1098 and finally the Panigales, which are nothing short of breathtaking. I'm sure this will get me considerable hate, but I feel it's time for MV to go down that same adventurous path and I hope that happens once MV sorts its financial security out. What's clear is that the Kawasaki doesn't hold a candle to the Italian in the looks department. Like most Kwackers, the 10R trades beauty for a mean, intimidating look. On it's own, the Ninja is an imposing head-turner, but against the MV it looks a little fat, especially at the tank and fairing section. In truth, the Ninja is actually well proportioned, but the MV has one of the slimmest inline 4-litre engines ever made. While the MV feels smaller, its super-focussed riding position and wild performance will destroy any preconceived notions of this being a small bike. The Kawasaki's lurid green white and black scheme will appeal to some, but a less attention-seeking colour scheme would be nice. For now, only this KRT colour scheme is available. 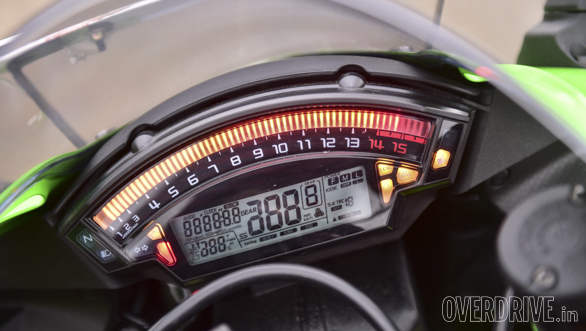 The Ninja strikes back with its handsome tail section, and we're big fans of the Kawasaki's digital display that uses an LED bar for the rev counter. It's much nicer to read than the MV's large but low-res digital screen. As strange as it sounds to say this, the Ninja is the better finished bike too. 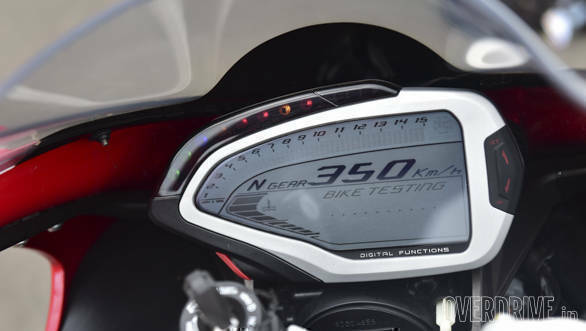 Like with the Brutale 800, MV could have done a better job with hiding some wiring and connectors that shouldn't be visible. There's also an unfinished hollow section at the end of the MV fairing near the back wheel. Still, it's no contest and the MV is the looker here. We weren't expecting otherwise. Current litre-class bikes have among the most powerful engines in the world when it comes to specific output, precious few production vehicles run them close. With an output of over 200PS per litre, it goes beyond simply saying one engine is better  they're both bloody incredible. However, they are quite different in nature. The MV motor is famous for its radial valve arrangement, a technology that facilitates cleaner and more efficient combustion. This is done through a hemispherical arrangement of the valves where the intake and exhaust valves slightly face each other. Working with the radial valves is an aggressively oversquare set-up (79mm bore x 50.9mm stroke), and this results in a tremendously revvy and powerful feeling motor. 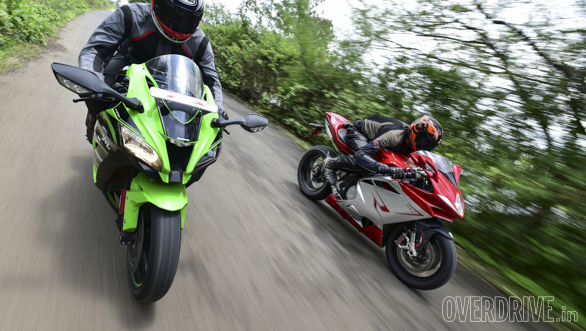 The moment the 998cc, 195PS engine fires up, you understand that this is an inline-four unlike any other. Instead of the traditional smooth hum at idle, the MV produces a raspy growl. Small blips lead to sharp rises in the revs with an angry bark from the organ-pipe exhaust. The throttle is sharp and the F4 conveys a constant sense of wound up urgency. There's an unshakable suspicion that lurking under the sensational beauty is a raging psychopath who's waiting for the slightest excuse to bash your head in. As expected, the beast stirs to life the moment you open the throttle in first gear with any sense of purpose. Unlike the Ninja, the MV makes strong power right from 4,000rpm and by about 10,000 rpm, as the intake configuration changes, she's pulling a big wheelie. My scaredy-cat instincts slightly cut the gas to bring the front wheel down, but nailing it back open only brings it right up again! Keep it pinned in second and the front stays light the whole time. Hit a minor crest in third and the front wheel wants to paw the sky. The violence only ends when you back off the gas. My hands have begun a slight memory-induced tremble as I type this. Amazingly, all this is with the traction control in Normal mode, Sport mode being a bit too liberal for wet roads. 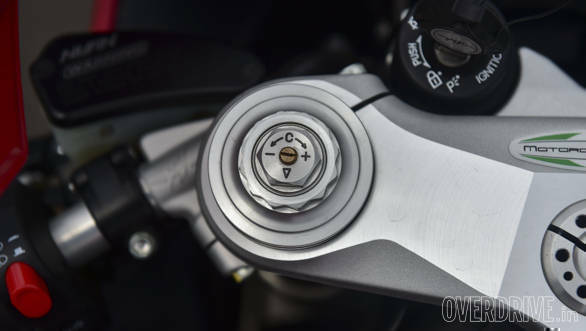 In fact, the MV has a comprehensive electronics suite that includes ABS with Race mode. It also offers eight levels of traction control, three-stage adjustable throttle sensitivity, engine torque and engine braking. There's also a quick shifter but I encountered a number of false neutrals over the day and eventually chose to stop using it. 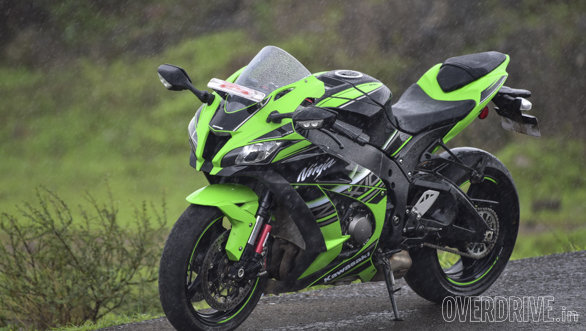 The Ninja meanwhile offers three power modes, five traction control modes and three-stage launch control. Engine braking control is available but it doesn't reduce the engine braking effect on a closed throttle as much as the MV. 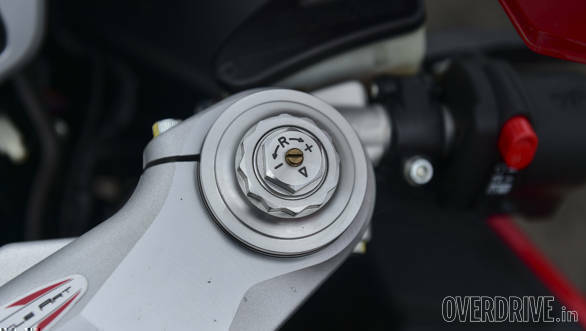 Finally, there's the enjoyable quickshifter that, like the MV, is upshift only but never misses a gear. Overall, both offer similar levels of assist, but the Ninja's electronic's are easier to navigate compared with the tedious MV interface. Both bikes run aggressive track-focussed rubber with minimal grooves and sipes  Pirelli Supercorsa SPs on the MV and Bridgestone RS10s on the Ninja. In the dry, these are some of the best tyres money can buy short of full on race tyres. By design, however, these tyres have aggressive wear and very short lives, often less than 4,000 km. Something to consider when you buy one of these hyper machines. Although most owners won't venture out in this weather, it's also worth noting that wet performance isn't a strong point either. 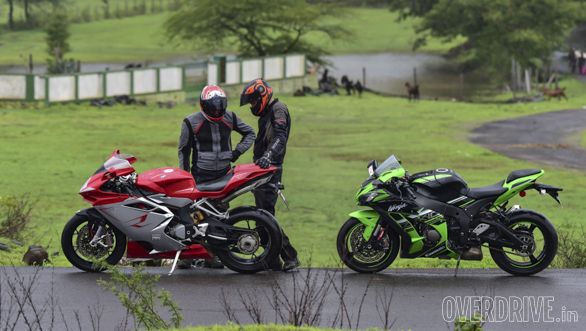 It was entirely down to the advanced electronics packages on the both bikes that we had an enjoyable time, even in the wet. In comparison to the madness that is the MV, the even more powerful 200PS Ninja (210PS with ram air effect) can be a surprisingly docile motorcycle. In fact, till about 5,000rpm you could even call her disappointing. The Ninja has a very soft and friendly power delivery at low speeds that makes it an absolute pussycat in town. The engine is creamy smooth, and throttle response is just the right amount of sharp. However, all doubts about this being a boring ride vanish when you cross that 6,000rpm mark. Power arrives in a strong wave, but not in an, 'oh god, I'm going to die' two-stroke like explosion. From 10,000rpm to the near 14,000rpm redline, the Ninja is a life affirming rocket of a motorcycle. 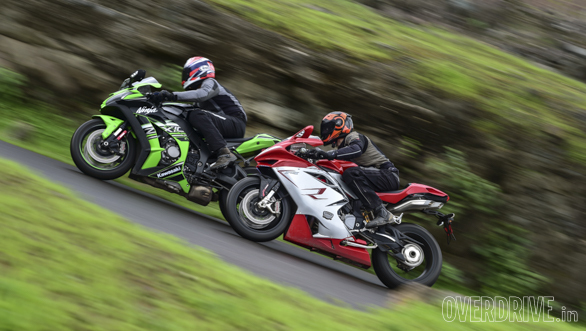 Ultimately, I think both bikes will be just as fast, the MV perhaps being a smidge quicker to 100kmph (both should clock 3.0s or just below from 0-100kmph) while the Kawasaki should have the top-end bragging rights. Given the weather and the fresh MV engine, we didn't risk testing the bikes. However, we did manage a highway mileage run and got 18.2kmpl from the Kawasaki and 16.1kmpl from the MV. Sadly, we couldn't push these bikes to our limits because of the rain. But we did get a fair understanding of what they're about. Unsurprisingly, the MV is the more focussed, racier feeling motorcycle. We originally found the 2016 ZX-10R's riding position quite aggressive with low clip-ons and uncomfortably high-set footpegs. The MV takes this to the next level. It's a rather old-school set-up, You sit quite high on the bike and the clip-ons put you in a constant race crouch. Compounding the sensations are a clutch heavy enough to be considered gym equipment and vast amounts of heat. The seat, fairing and even the fuel tank get quite hot, especially in traffic. And never, not even by mistake, should you touch the right footpeg with an un-gloved hand after a ride. On a smooth winding road, the MV with its Marzocchi forks and Ohlins rear shock feels like magic. It has a firm, racy feel and offers even sharper responses than the already scalpel-like Ninja. Direction changes are instantaneous, and the bike has huge reserves of grip and feel when leaned over. Conversely, the MV doesn't have the same plush damping of the 10R, and as a result it doesn't like mid corner bumps or rough roads. It's not unusable, but requires more attention and is certainly less forgiving. Suspension is fully adjustable though, we'd back off the forks and monoshock to try finding a suppler ride for the street. For 2016, the Ninja got the excellent and fully adjustable Showa Balance Free forks and Balance Free Rear Cushion monoshock. This suspension offers a sense of pliancy and confidence on imperfect surfaces that the MV cannot match. 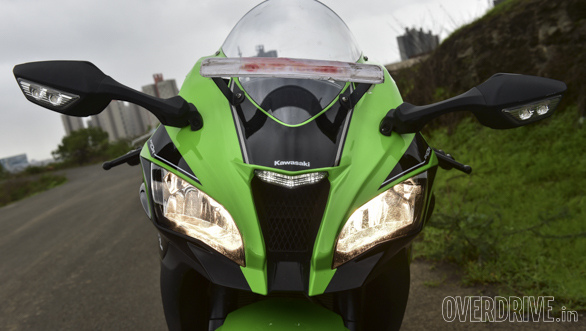 Imperfections are better absorbed, allowing you to fully enjoy the Kawasaki's excellent front-end feel. The bike feels light and flickable and reacts to your inputs exactly as you would expect. On a racetrack, a skilled pilot might prefer the hard-edged MV, but on the road, the Ninja has an encouraging sense of fluency that complements its outstanding dynamic capabilities. In town, heat is managed well and the clutch is pleasantly weighted. With lower aftermarket footpegs or slightly raised clip-ons, you could do a lot of real-world riding with this bike, come rain or shine. 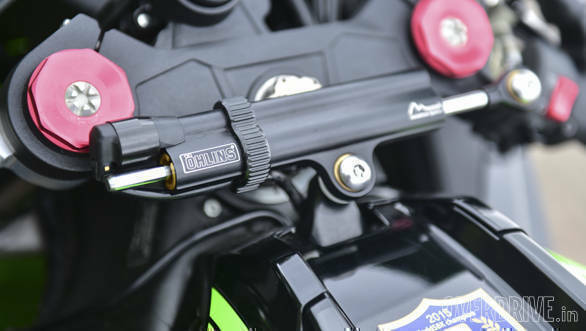 The Kawasaki offers top-spec Brembo M50 brakes versus the MV's combination of Brembo M4 callipers and a Nissin master cylinder. Real-world performance was spectacular on both with sharp bite and good progression. If there are any considerable differences in ability and feel, they will only become apparent under extreme braking at the racetrack. 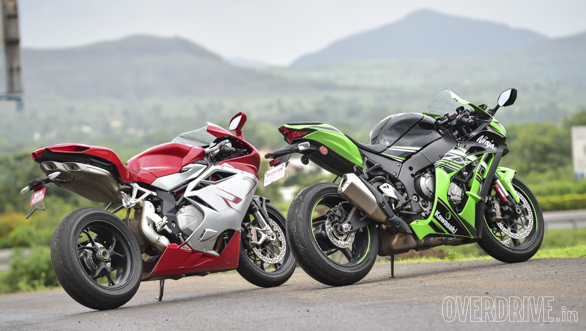 Both have steering dampers, the MV with a manually adjustable unit while the ZX-10R offers a vastly more advanced, electronically controlled Ohlins Mechatronix damper. 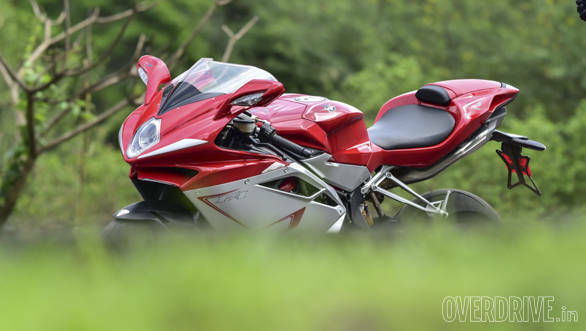 The MV Agusta F4 R is a riot of sensations. It's definitely left the more dramatic impression on me and is every bit the exotic machine you imagine it to be. The MV's combination of heartbreaking looks and cardiac-arresting performance is a special thing. And it happily sacrifices comfort and practicality to serve this particular dish of awesomeness. Naturally, this comes for a very high price  Rs 29.09 lakh (all prices ex-Pune). The F4 R is discontinued internationally and only a few bikes are on offer in India. But there's also the choice of the base F4 with lower spec suspension and brakes for Rs 26.87 lakh. Or, for Rs 35.7 lakh, the F4 RR with electrically adjustable Ohlins suspension and a smidge more power. 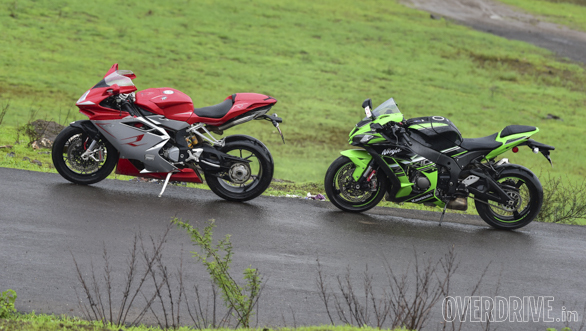 Because this is an MV Agusta and F4s are rare and mythical creatures, it cannot be any other way. The high price only enhances the desirability. We could have used any litre-class bike here, but the Kawasaki seemed particularly appropriate as it is new, clearly extremely effective and yet, the new model arrives without any startling jump in price. The Ninja is just as capable as the MV, and while its performance is less dramatic, it still offers an equally stunning skill set that only the most talented of riders can fully exploit. In many ways, though, it is a more friendly and usable motorcycle. And then, of course, there's the incredible Rs 16.4 lakh asking price, nearly half of what the MV costs! On our salaries, the Ninja is a dream that someday could be achieved, whereas the MV will always remain just that. A dream. Update: Just a few weeks after my rant on the ageing F4 design, MV Agusta revealed the radical and polarising F4Z concept. Let us know what you think!